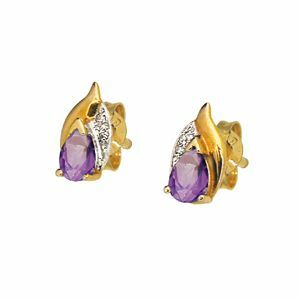 Pear cut amethyst and diamond solid 9ct yellow gold stud earrings. Gemstone: 2 x amethyst dark purple pear cut 6x4 mm. Gemstone: 4 x diamond round G colour PK1 clarity .005 carat. Type: amethyst gold stud earrings.